I was alone in my room when I saw something moving out of the corner of my left eye. 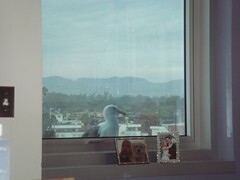 Considering I am on the fourth floor of the hospital, I cautiously moved my eyes to the window, only to happily discover my Sea Gull friend!!! He stayed at the window for about 10 minutes, watching TV with me. Come back, gull friend!